Recently, photographer Cynthia van Elk took to the sky to capture Rodale Institute’s new research trial. The project, carried out in partnership with Stroud Water Research Center and with funding from the William Penn Foundation, analyzes the relative effects of conventional and organic agricultural systems on the Delaware River Watershed. 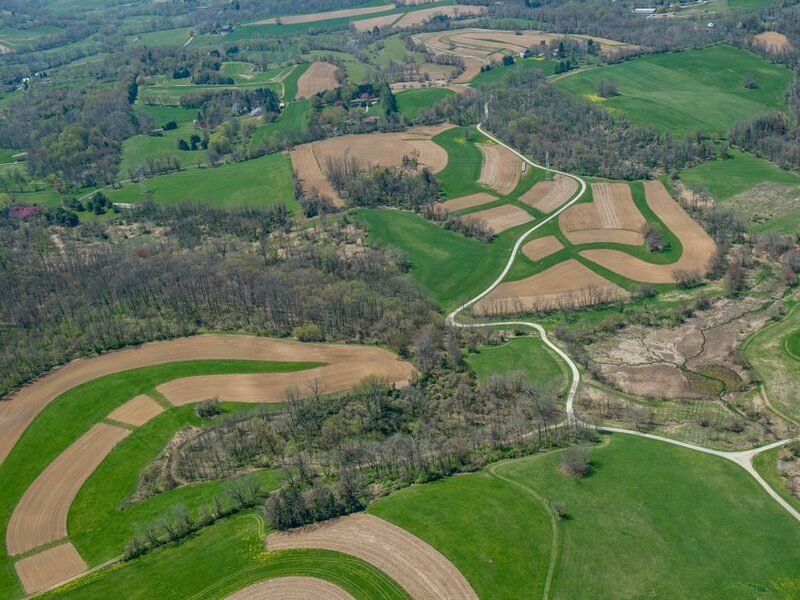 As a freelance photographer, I’m accustomed to a diverse array of assignments, but aerial photography wasn’t on my roster until Rodale Institute proposed hopping in a small plane to photograph their new research project at a low altitude. I was thrilled at the opportunity. My pilot was Geoff, a volunteer with LightHawk, a nonprofit organization that recruits volunteer pilots to fly for conservation purposes. He called me twice prior to the morning of our departure to go over weather, his plane, our flight plan, and my camera equipment. 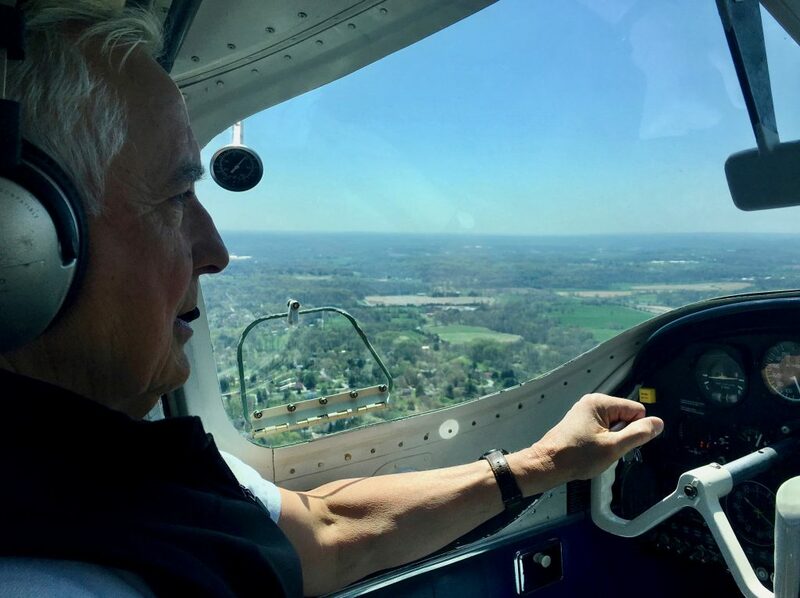 Geoff’s 50-years’ flying experience, kindness, and hospitality put me at ease. The plane—a Lake Buccaneer—was unlike any I’d seen before. Its engine is located on the roof, making the plane suitable for landing and taking off on water. Locked to the insides of the plane are wooden paddles, just in case we had to row the plane to safety. Thankfully, we didn’t need them on this trip! The plane is further equipped with two tiny sub-windows that can be opened. It was through these that I placed my lens. Geoff would need to roll the plane on its side to grant perspective of the ground for my camera. We had to consider the position of the sun and prevailing winds. Communication was essential at every stage, from our pre-flight checklist on the tarmac to coordinating my shot at 750 feet. From our unique vantage point, I saw housing developments and distribution centers spreading out and encroaching on farms, and I was reminded of how important it is that we conserve the land that feeds us. Projects like Rodale Institute’s collaboration with Stroud give me hope for a healthy future in Pennsylvania and beyond. Cynthia van Elk is a Dutch photographer based in Brooklyn, NY.